Inflation diffusion is high over three months, six months and 12 months. The diffusion values show that inflation diffusion is well above the ‘neutral’ 50% mark on these horizons. Diffusion counts the number of sectors where inflation is accelerating and adds half the number where inflation is stable. A diffusion reading of 100% means that inflation forces all are pushing higher (all sectors accelerate). At a value of 50%, inflation forces are balanced (accelerations balance decelerations). At zero percent, all sectors are decelerating and prices are collapsing. France has a situation in which the HICP is stable over 12 months and six months then accelerating over three months. Its domestic CPI measure is more stable with inflation at 2.2% over 12 months and three months but dips to a 1.9% pace over six months. Domestic core inflation dips from 1.3% over 12 months to 1.1% over six months then advances to 1.4% over three months. And despite that sort of headline and core rate trend prevarication, the diffusion indexes tell us that sector by sector inflation has been generally rising in more sectors than it has been falling on all horizons. How can you ‘square those seemingly opposite characterizations? Headline and core measures and diffusion measures take different approaches. Diffusion data are not weighted by sector. Diffusion an unweighted concept that looks at the breadth of inflation. The headline and core measures are weighted within their separate definitions. Those differences produce different results. 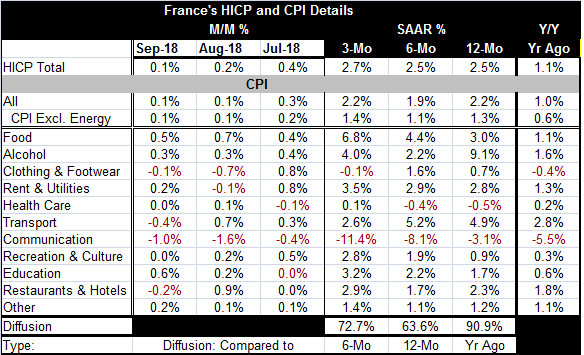 We can conclude that inflation forces in France are present but not intense and clearly not as present in items with the largest weights in the CPI and HICP inflation measures since diffusion shows more inflation than either the core or the headline. Three French sectors show persistently accelerating inflation: (1) rent and utilities, (2) recreation and culture, and (3) education. Only the communication sector, a high technology usage sector, shows persistent inflation deceleration from 12 months to six months to three months. And despite all these forces, core inflation is still only at 1.3% over 12 months. Headline inflation in France is high and on the uncomfortable side (2.5% for the HICP and 2.2% for the domestic CPI measure). But the core, free of the effects of energy where prices have spiked this year, offers a good deal of padding between itself and the ECB’s policy goal pace. So inflation is both percolating and being held at bay. The international forces of completion are still in play and providing restraint. Central banks are having a hard time getting their arms around these events in making policy.